School District 202 Superintendent Eric Witherspoon, seated, and Evanston/Skokie School District 65 Paul Goren address more than 200 Evanston parents, community members and school district alumni about the current state of and future plans for Evanston schools. 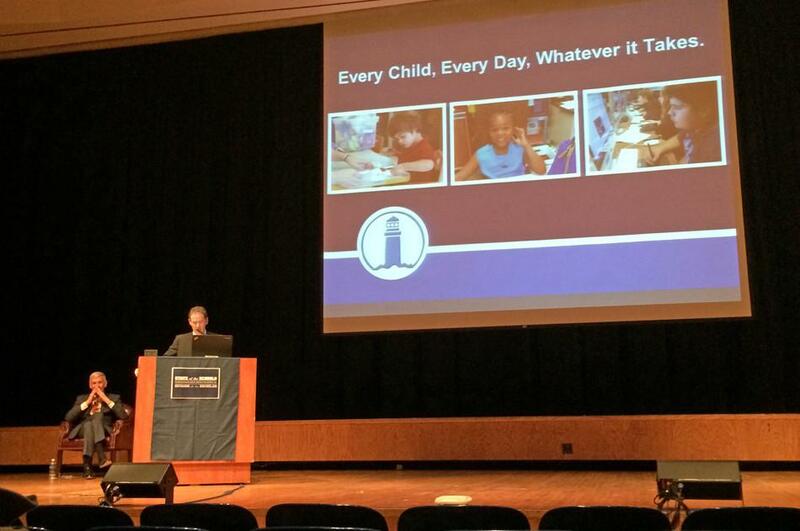 Superintendents of District 202, which serves Evanston Township High School, and Evanston/Skokie School District 65 delivered a “State of the Schools” address at ETHS on Thursday evening, the first event jointly hosted by the districts in recent history. Throughout the hour-and-a-half program in the ETHS auditorium, District 65 Superintendent Paul Goren and District 202 Superintendent Eric Witherspoon discussed the current statistics, programs, challenges and goals of their respective districts, as well as collaborations between the two. District 65 and District 202 alumna Jacqueline Newsome opened for the superintendents, discussing the academic foundation Evanston’s school system provided her to later attend New York University and the University of Chicago Law School. Despite her praise of districts 65 and 202, Newsome reflected on microaggressions she endured throughout her secondary education because of her race. Students of color are a majority both at ETHS and in District 65, and both superintendents discussed the importance of providing equal opportunities and instruction to students from all backgrounds. Goren discussed, among other things, District 65’s top five priorities in the coming years: high quality teaching and learning, a thriving workforce, family and community engagement, safe and supportive school climate and financial sustainability. One major topic of discussion was the implementation of Partnership for Assessment of Readiness for College and Careers standardized testing in schools, as part of the new Common Core standards for public schools in the country. Audience members questioned the financial practicality of enacting PARCC testing in Evanston schools. Goren explained that their budgets could suffer serious cuts if they refused to comply with state reforms. An educational bright spot for both schools was collaborating with Northwestern, particularly in fostering science, technology, engineering and mathematics education in both schools. The seminar closed with a question-and-answer session in which Goren and Witherspoon answered questions from the audience and shared remarks about their growing partnership.